Governor Reynolds tours flood damage in Hornick with Mayor Scott Mitchell on Sunday March 17. Iowa Gov. Kim Reynolds is asking President Donald Trump for $1.6 billion in federal assistance to help Iowa recover from catastrophic flooding. Major flooding has caused widespread damage and led to several communities being evacuated. An analysis from Iowa Homeland Security and Emergency Management estimates about 1,200 residential structures have major damage or are destroyed. Gov. Reynolds sent a letter to President Trump on Thursday requesting an expedited Presidential Major Disaster Declaration to help 57 counties recover from damages. Of the $1.6 billion requested, Reynolds is asking for $481 million to repair homes with minor and major damage. She is also asking for about half a billion dollars to repair 245 miles of levees. President Trump approved Nebraska's Disaster Declaration on Thursday. Flooding in Hornick, Iowa, seen on Sunday March 17. Extreme damage to Missouri River levees from flooding has officials in southwest Iowa concerned that they won’t be fixed in time for more possible flooding this spring. These levees that are built to prevent rivers from overflowing are in disrepair. More flooding is forecast for Iowa and much of the U.S. as spring arrives. The National Oceanic and Atmospheric Administration (NOAA) has released its spring outlook, predicting the majority of the country is favored to experience above average precipitation this spring. 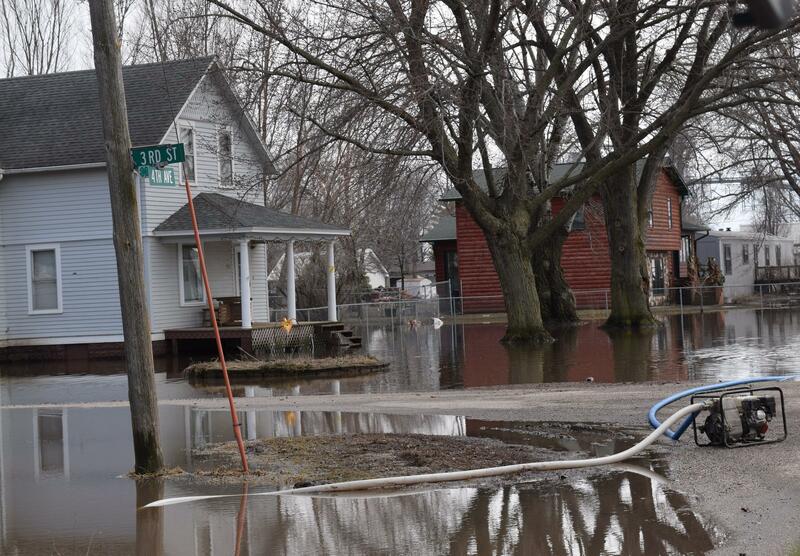 The Midwest has already experienced historic flooding this month, and NOAA predicts continued snow melt and additional rain will prolong and expand the flooding. Nearly two-thirds of the lower 48 states are at an elevated risk for flooding through May. Gov. Kim Reynolds said Tuesday “catastrophic” floodwaters in southwest Iowa have devastated communities and farms in recent days, and there is more to come.